What began in 2013 as a casual conversation between faculty members and executives-in-residence at the Johnson Shoyama Graduate School of Public Policy (JSGS) has resulted in research that has the potential to impact future budgeting decisions in the Canadian K-12 education sector. 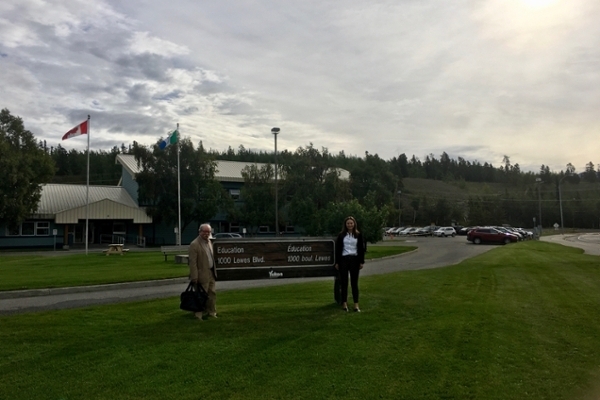 On August 27, JSGS Executive-in-Residence, Jim Marshall, and Ph.D. in Public Policy candidate, Stephanie Ortynsky, traveled to Whitehorse, Yukon to share the results of a major study that began at the JSGS in 2014. Titled, Understanding Cost Efficiency in the Public K-12 Education Systems: A Behavioural Approach, the project examined the Canadian K-12 education system to establish the importance of efficiency in decision making, specifically when decisions have an impact on budget allocations. “It was an honour to represent the Johnson Shoyama Graduate School at two very important meetings in Whitehorse,” said Marshall. Marshall and Ortynsky presented the findings to the senior management team in the Yukon Department of Education as well as senior federal, provincial and territorial budget officials at the 37th annual Intergovernmental Budget Conference. Chairing the conference was Chris Mahar, the Assistant Deputy Minister, Management Board Secretariat for Yukon. She was impressed by the work done by the JSGS and appreciated the excellent presentation delivered by Marshall and Ortynsky. JSGS Associate Professor Haizhen Mou led the $68,957 project, funded by the Social Sciences and Humanities Research Council of Canada (SSHRC), in collaboration with Marshall and Professor Michael Atkinson. When it began, little was known about the efficiency of the public education system in producing desired outcomes with public resources or about how efficiency is considered in budget processes. The team aimed to fill this gap through a series of interviews they conducted with managers in the public K-12 education sector and in central budget authorities across 12 out of 13 jurisdictions in Canada. In these interviews, managers were questioned about their budgeting practices and whether the success or shortcomings of students influenced the following budgeting decisions. What resulted was the understanding that education systems across Canada have the opportunity to better improve productivity through more efficient budgeting. “It was amazing to see that the academic research work being done by the faculty and students in the school is relevant, important and well-received by practitioners at the highest level in government in two completely different areas of public policy,” said Marshall. Ortynsky was fortunate for the opportunity to be a part of a project that has direct relevance for provincial and national budget officers, as well as the Yukon Ministry of Education. Marshall said he was proud to see how well a JSGS student was received by the practitioners. He commended Ortynsky on her confidence in discussions with senior government officials and is certain that all JSGS students are capable of participating in high level discussions in public policy and public administration. “It was a great experience to see how relevant and important the research work of the school is and, at the same time, to have confirmed what great students we have,” Marshall said.